In 1992, author Lee Israel, whose biographies on figures such as Tallulah Bankhead and Estee Lauder had met with either mild success or public indifference, found herself working menial hourly jobs just to get by. No longer a viable name in publishing, Israel was at a loss; unwilling to give up her career as an author, yet unable to sell her dream biography of an obscure vaudeville star. While researching her new book, she runs across a letter from Noël Coward in a dusty volume in the library, and is inspired to start forging letters from famous literary figures, selling them for exorbitant sums and raking in the cash. But when buyers become suspicious, Israel soon finds herself in far more trouble than she ever anticipated. The great irony of Israel's predicament, of course, was that for the first time in her life, people were clamoring to pay for her writing. Yet no one knew they were her words - written under the guise of far more well-known authors, Israel was finally getting the praise she always felt like she deserved, but someone else was getting all the credit. Melissa McCarthy beautifully embodies that inner conflict as Israel in Marielle Heller's Can You Ever Forgive Me?, taking the idea of the sad-sack loner she has played to such great comedic effect in films like Identity Thief and Tammy and giving it an added sense of pathos. 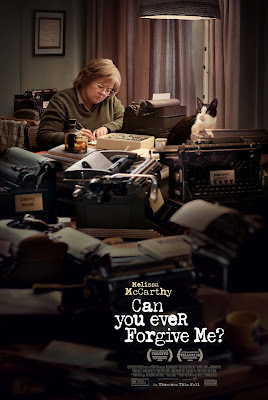 McCarthy takes an inherently unlikable character, a bitter alcoholic whose acerbic wit is usually at someone else's expense, and makes the audience feel for and even identify with her. Yet while Israel is busy alienating everyone in her life, save for her similarly devious but none-too-bright partner in crime, Jack Hock (Richard E. Grant), McCarthy is busy worming her way into our hearts, making us care about the plight of a woman who was, by most accounts, wholly unpleasant. The film is based on Israel's own confessional memoir of the same name, and yet it doesn't hold back in depicting her myriad flaws. Heller never asks us to absolve Israel's crimes, but she does ask us to understand her motivations as a flawed human being in a desperate situation. McCarthy takes this to the next level, digging into Nicole Holofcener and Jeff Whitty's biting screenplay with relish, finding the humanity of her character even at her most repellant. The film cuts a few narrative corners along the way - a scene near the end of the film featuring a frail Hock to let the audience know that he contracted AIDS feels like a last-minute piece of Oscar-baiting character development shorthand - but Heller keeps the action tightly focused on Israel and McCarthy's beautifully burnished performance. Shot in drab browns and grays, Can You Ever Forgive Me? indelibly captures Israel's shabby life, but McCarthy gives it the warmth it needs as the film's morally dubious center. She allows us to peak inside the mind of a woman who made some bad decisions and got in way over her head. And while none of us may take even a seemingly innocent crime to such devastating lengths, it illustrates the slippery slope between white lies and felonies with disarming narrative grace, reminding us that being a criminal doesn't necessarily make one a monster. CAN YOU EVER FORGIVE ME? 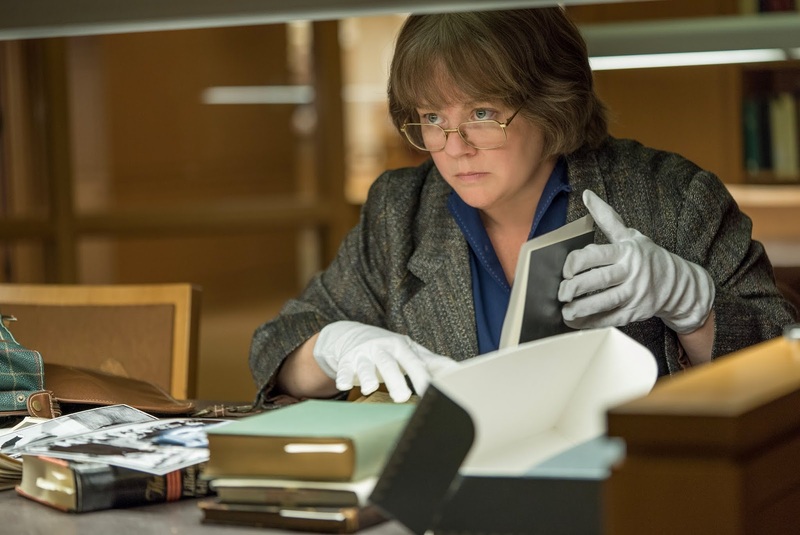 | Directed by Marielle Heller | Stars Melissa McCarthy, Richard E. Grant, Dolly Wells, Ben Falcone, Gregory Korostishevsky, Jane Curtin, Stephen Spinella | Rated R for language including some sexual references, and brief drug use | Now playing in select cities.